WATCH THE RECORDING OF THIS DEC. 6, 2016 CITIZEN ARTIST SALON. Poet Joy Harjo wrote that "perhaps the world will end at a kitchen table...while we are...eating of the last sweet bite." Story circles, a time honored tradition and technique of community building and collaboration, are like these familiar kitchen tables where the delicious parts of life converge and mingle, but instead of the table, we gather around each other to share the sustenance of our stories. In this session, you’ll hear from several USDAC organizers across the country who've hosted story circle events for different groups and audiences. 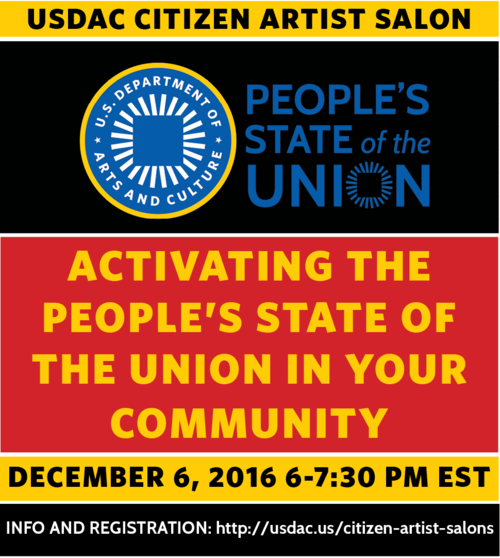 You'll leave inspired to plan a story circle event in your area for the USDAC’s upcoming People’s State of the Union action in January 2017. Charlene Martinez Qoalexenze (USDAC Cultural Agent and Associate Director of Integrated Learning for Social Change within Diversity & Cultural Engagement at Oregon State University). Moderated by Yolanda Wisher, Chief Rhapsodist of Wherewithal and current Poet Laureate of Philadelphia.